This movie was pretty good. I was worried that the charm of the movie wouldn’t last through the entire 1 hour and fifty minute run time, but where the charm failed, the dry humor was there to pick up the slack. 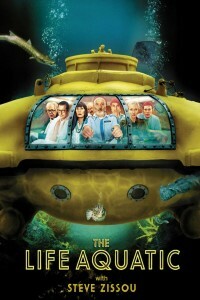 As the summary said, Bill Murray is hunting down a shark that killed his friend, and the movie is about this journey to get revenge. The plot is simple and it has some pretty fun moments with a few twists and turns that at least keep you interested into it. Wes Anderson Movies are always that way, Charming and slightly awkward. They defiantly have the cringe factor but it does it in such a way where it really works. The story was alright but it’s the interactions between the characters that really make this movie. While they never really go in depth with many of the characters the characters that they do go into have a very interesting relationships. The music is really, really good. It’s David Bowie songs covered and translated to Portuguese by Seu Jorge, and it is fantastic. If you want a movie with a great soundtrack this is a movie for you. They cut from the actual story just to have Seu Jorge sing a part of the song. This sounds like a bad thing but I really like it actually. The music really adds some atmosphere to this movie and it’s simply put nice. This movie is on and will be watched on Netflix. I honestly don’t really know what to think of this movie, it has a well known cast and it seems super colorful which is a pretty welcomed change form all the zombie and horror movies I’ve reviewed so far. If anything I’ll bet my first born child that this movie will not take itself seriously, which would be honestly refreshing. I’ve drawn this conclusion from the casting primarily and it’s only now while typing this preview out that I realize that this movie is a Wes Anderson film. That means it’s going to be charming, slightly funny, full of heart, super weird and not something I’d watch normally, but most of all it’s something that I’m going to come away from not really sure if this was a waste of time. This new development only makes the summary slightly more unusual, “A scientist at sea grapples with pirates, his wacky crew and his ego while trying to avenge his friends death”. 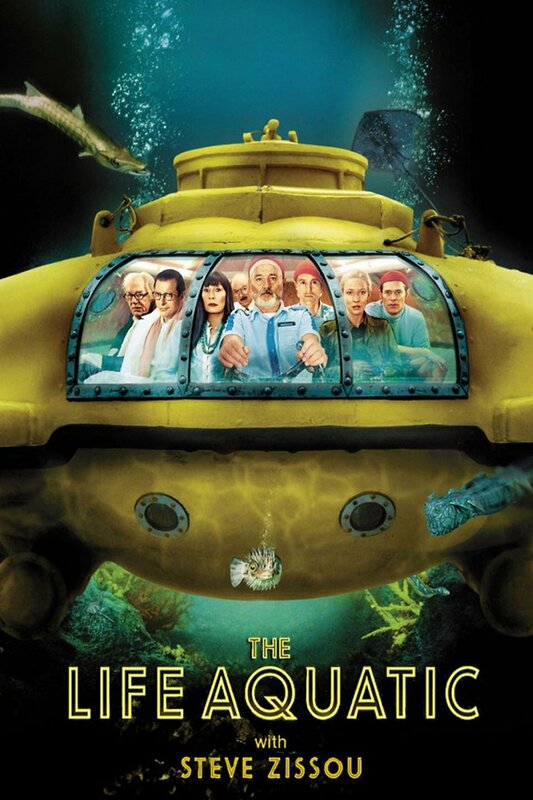 This honestly just sounds like a Wes Anderson movie from just that, I don’t know how much I’m going to be able to write about this for the Review, honestly a Wes Anderson film is a Wes Anderson film, enjoyable but also super quirky and honestly kind of weird. I hope that this movie is really good, but if I know Wes Anderson like I think I know Wes Anderson, I’ll enjoy it but something inside of me will still have something against this movie. First off this review will contain spoilers, which is fine because no one should watch this movie. You know how some movies can be vague but still give enough answers where it feels like you can watch it and know what’s going on the first time watching it? we this movie tries to do that but it completely fails at it, it does not explain practically anything. The movie follows a group of mercenaries, what they’re doing you don’t find out till the end of the movie. They have these two hostages, why they’re there? The movie keeps it extremely vague. On a farm the mercenaries leaves one guy and finds another girl. why this girl is important to the story, no one can say. I could literally ask a thousand more questions, like why did they feel the need to have a pooping scene, but honestly there’s really no point in asking these questions because for most of them they’re not going to have any answers. Movies that keep things purposefully vague for the sake of adding a feeling of tension are alright if they do it well, but this one doesn’t. The twist of the movie is that this was all an experiment by some amoral company to test… some sort of orange powder. This movie is also really slow and nothing really noteworthy happens in it. I’d say the only reason someone should watch this movie is if they wanted to waste an hour and a half. least adventure in an action adventure movie. This movie is on, and will be watched on Netflix. Tank 432 is a movie about a few guys in a tank, but supposedly it’s a horror movie so this could go almost anywhere. The short summary of the movie tells us that a group of mercenaries are running for their lives, but it never tells us what they’re running from. For all we know it could be that their are running from their responsibilities, probably not though mercenaries are very responsible. The summary is very secretive all it really says is that they’re scared, they hide in the tank, and then it says the terror is just beginning. so there’s not much to go on, and even the director doesn’t have any other movies on Netflix so there’s no indication of how this movies is actually going to be. It does have a high match righting so I guess it will be good at least by my standards, which aren’t that high I didn’t think the Star Wars Prequels were that bad. Well, lets hope that his movie isn’t actually that bad, I’m personally not holding it to being good. recently the movies I’ve been reviewing have been declining in quality. This pre view has been really hard to write there isn’t a lot to go off of the summary. Action & Adventure, Action Thriller, Horror movie, some pretty mundane genres that this movie fits under. This first part of the review will be thoughts and comments that I had while watching the movie. The first thing this movie shows you after the studios is this quote from some sort of ghost hunting book written by the main character. “OBSERVATION: Between 1914 and 1919 war and influenza have claimed more than a million lives in Britain alone. -Florence Cathcart ‘Seeing Through Ghosts’ p7. This is just silly to me, she sounds like a middle schooler trying to be all macabre and edgy. I think I now have a better idea of what this movie is going to be like. I always feel weird watching movies set in the time right before world war two, seeing all these kids running around and knowing that in a few years they’ll be shipped off to war. This would set off a second time for ghosts, well I guess they’ll always have content for a sequel. It’s super odd how they’re getting a hoax critic to solve a very real death even if it may have been a spook that killed him. They’re using the same building as the one in a version of pride and prejudice I had to watch for highschool and it made me instantly dislike this movie. It also has the actor who plays bran stark from Game of Thrones which makes me feel bad about myself because someone younger than me is way more successful. You know that one cliche where they finish a conversation about going somewhere and the next scene they’re already halfway there? Well, this movie does it but she never actually agreed to want to go, and there wasn’t even any indication that she was going to change her mind, which leads me to believe that they forgot to make the scene where she finally agrees or they didn’t care enough to actually put it in. Okay, this is one of those twist movies that attempts to explain scenes that didn’t originally make sense, and without giving away the twist I have to say it’s one that originally got me. That is until I thought about it more and realized that there was ZERO indication of the twist. well there was some things but you really have to watch it a second time, but there also some scenes that really didn’t show this off too well. It just kind of changed everything and said: “this is how things are now, this is what happened”. I’m writing this while watching the end of the movie and it’s pretty good, you just have to think about it. But I don’t like thinking while watching movies. I’ll have to give this movie the prestigious “a smart movie for smart people” award. Movie that Demands a second watch, in a good way, you know kind of like Sixth Sense *cough cough*. This movie is on Netflix and will be watched on Netflix. 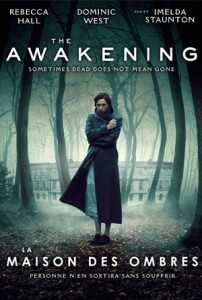 The Awakening is a British movie that is about spooky ghosts. More specifically this movie is about someone who doesn’t believe in said spooky ghosts. From the genres, and the “This movie is” lists this movie seems to be a spooky scary ghosty suspenseful movie. From the summary, it seems that the movie follows a character named Florence Cathcart who disproves hocus pocus styled stuff, but this ghost isn’t so easily not believed. It tries to spend the entire movie spooking her into believing in it, but will it succeed? Also, it Takes place in a boarding school which is pretty much the most British thing I can think of. I can sympathize with this ghost, it can be hard to get people to believe in you. No one believed in my dreams about not doing any of my work and stumbling my way through the first few years of college, but look at me now! I’m still here and I only stumbled a little bit. This ghost just wants people to believe in him, and here comes this lady trying to prove that he can’t do anything because he’s not real. Well, I believe in you ghost, you can finish college. This movie was not a very fun one to watch, Nick cage’s ability to see 2 minutes into the future is used quite extensively. It even has some decent story points but halfway through the movie, they change it to where he can actually see what’s going on with the nuke. It’s pretty much only functions as a way for the story to continue, and aside from the first 10 minutes or so doesn’t really feel all that neat. The characters were all fairly decent, I didn’t have a problem with any of them for the most part, although Nick Cage is always a weird actor who, at least to me, seems he’s always miscast. This movie also plays around with the whole, scenes in the movie don’t actually happen it was all in the hero’s head, which is one of the most dangerous things a movie can do in my eyes. In fact, pretty much the entire second half of the movie is one of these, The whole second half of the movie is just a vision that Nick Cage has. This instantly makes me really dislike this movie. 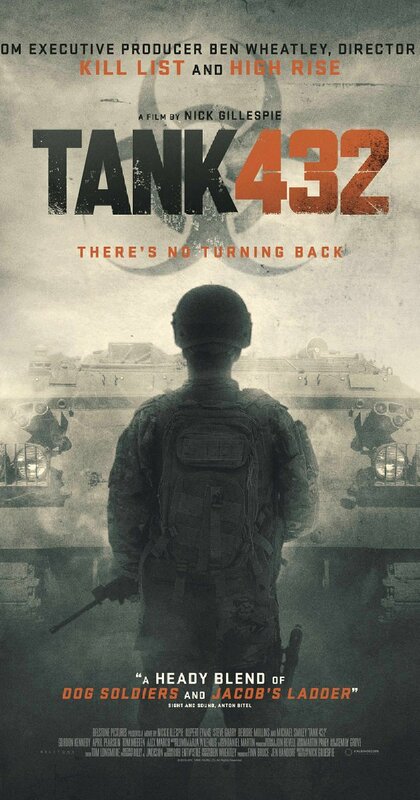 Movies like “The Last King” or “Wyrmwood” at least have some irredeemable qualities, but this movie is not one of those. The story is boring, Nick Cage just make things awkward, and the good points are all just decent. Bottom line I don’t recommend this movie. This movie is on Netflix and will be watched there. Next is a movie with Nicolas cage so it’s bound to be at least an entertaining movie. Like everything I’ve watched I know practically nothing about this movie, but I have seen another nick cage science fiction movie namely “Knowing”. If that movie is anything like that it will at least be watchable. Nick cage is one of the celebrities that I don’t really like, but I never dislike. He just has this weird charm where I respect what he’s doing, but I don’t want him anywhere near me. I want to assume that he’s completely different from the roles that he plays, but I heard that he thinks that watching his pet octopus makes him a better actor. I mean I’m not an actor, so I have no idea if that actually does anything for him. All I’m just saying that that’s not the most normal thing for a person to do. “Las Vegas magician Cris can see a few minutes into the future and an FBI agent wants his help thwarting a nuclear attack.” There are a few thing’s I want to point out: firstly spelling Chris without the “h” is actually physically painful for me to type, secondly I don’t think that the ability to see a couple of minutes into the future would be enough to stop a nuclear attack. A few minutes is not much time but I have a feeling this movie going to make it somehow a viable solution to disarming a nuclear weapon. What promised to be a fun friendship filled Pokemon adventure turned out to be a horror movie with not even a mention of a haunter. I was kind of expecting this, though hoping for it to not be the case. Anyways the movie itself was actually pretty decent all be it fast, although I don’t think that this is a completely negative point. The speed makes the movie makes it feel like the story is unfolding rapidly and it really makes the movie feel like this whole thing is the climax of a much larger story. The movie starts out with the “rebellious teenage girl” archetype, she also plays a clarinet which you never really see in movies, being trapped in the movie groundhog’s day. She lives the same day with her family who are conveniently oblivious to this. She spends a while trying to figure out what’s going and through the use of a Ouija Board, she actually manages to find out that she is in fact dead and is being tormented by a much more powerful ghost who had a hand in her death. This all happens in the first part of the movie and happens fairly rapidly. The rest of the movie his her trying to convince her family that they too are dead, saving a girl from falling into the same fate, and freeing her family from the evil dead guy. This is a pretty decent movie, if you like fast paced movies this one is a good movie for you. This Movie is available on Netflix and will be watched on it. I chose this movie simply because I thought that the name was a Pokemon name, and I was right. Now if I know Pokemon, and I think I know Pokemon, this movie will be about a girl trying to catch a haunter, possibly trying to evolve it. The thing is she doesn’t have anybody to trade with so she has to spend the majority of the movie trying to befriend some random person on the street or internet. This movie could be a really good entry into the Pokemon universe, although it is a tad weird that they chose to not title it with the traditional Pokemon title. Another weird thing about this movie is that it’s a horror, good on Nintendo for trying to branch out into another genera. Hopefully, the Pokemon spirit will survive the transition, but who knows it could not work. This movie has an uphill battle, while Pokemon does have some pretty creepy stuff, it’s never on the surface. I haven’t watched the trailer, I feel that it’s easier to make stuff up when you know as little as possible about a subject. Hopefully, this Pokemon movie will be a pretty good movie and not destroy my childhood. I’m holding out a lot of hope for this movie.